In celebration of the heritage of The Tremont House, A Wyndham Grand® Hotel, and the contributions of hotel owners George and Cynthia Mitchell, the hotel has added a small exhibit on the three Galveston hotels bearing its name and the Mitchells. Guests can find this free display just east of the front desk. The history of The Tremont House can be traced back to 1839 when the first hotel, located at the corner of Tremont and Postoffice Streets opened. A second, grander hotel existed from 1872 to 1928. The current Tremont is the third Galveston hotel to assume this name and honor this tradition. The Tremont House, now located at 2300 Ship’s Mechanic Row, opened in 1985 and is housed in the 1879 Leon & H. Blum Building. The hotel will celebrate its 30th anniversary in 2015. Cynthia Mitchell, who passed on Dec. 27, 2009 and George Mitchell, who passed away on July 16, 2013, were instrumental in the restoration and revival of Galveston’s heritage and culture. The Mitchell family continues to preserve Galveston’s Historic Strand District and is currently renovating the 1859 Hendley Building. One panel in the display focuses on their role in restoring The Historic Strand District. The hotel plans to produce a new audio tour available as a free app for smartphones in 2015 which will give a brief history on the hotel and the Mitchell’s role in preserving Galveston’s historic downtown. The exhibit is free and open to the public. 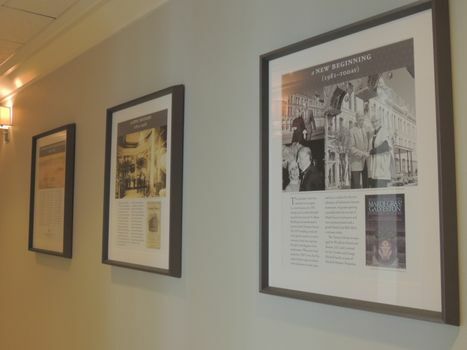 The Tremont House, located in the Historic Strand District, offers a small exhibit on the hotel's heritage and owners and their role in the revitalization of Galveston's downtown.